A scrappy initiative campaign to create a revenue-neutral carbon tax has run into opposition from major environmentalist groups and other Democratic Party allies. They want to run their own carbon initiative in 2016. 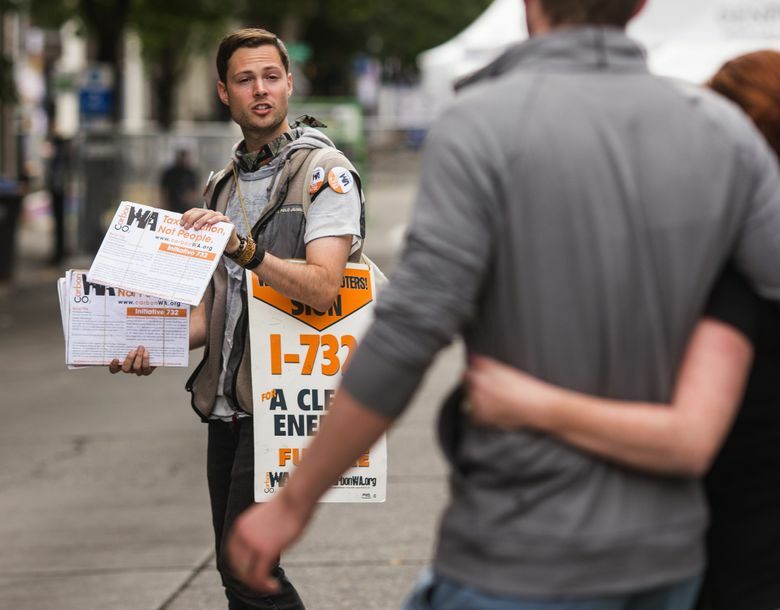 This summer, as Washington bakes in a West Coast drought, a flock of petition-toting activists has fanned out to parks, festivals and street corners, trying to force the sort of sweeping action on global warming that has eluded state lawmakers. That’s a goal shared by Gov. Jay Inslee, environmentalists, labor and other Democratic Party allies, who backed carbon-pricing legislation that was stymied this year in the Legislature. So you might think they’d get behind the scrappy, grass-roots I-732 campaign, known as Carbon Washington. Nope. Instead, a powerful coalition that includes the state’s major green and labor groups is trying to squash the effort. Leaders of the Alliance for Jobs and Clean Energy have sought to discredit I-732 in recent weeks. They’ve circulated poll results that suggest it would be rejected by voters. And they’ve argued the initiative is insensitive to communities of color. Alliance members say they’re working on their own climate-initiative proposal for 2016, one that would divvy up tax dollars differently, include input from a more diverse crowd, and, most important, have a better chance to pass. So, while they appreciate I-732’s goals and enthusiasm, they’d prefer it please step aside. “I think the best thing for the climate movement is for all of us to come together and combine our strength,” said Lisa MacLean, a Democratic political consultant and director of the alliance. I-732 backers say they’ve waited long enough for action from the political establishment and are pushing ahead. “They say that there might be another measure. I feel like some of those folks have been saying that for years,” said Yoram Bauman, co-founder of Carbon Washington. Both sides say this is a disagreement among friends. They all want the state to take serious action on climate. They just disagree on the best approach. The I-732 crowd is more of an upstart, eclectic bunch, led by Bauman, a Ph.D. economist who also performs as a comedian. He bills himself as the world’s first-and-only “stand-up economist.” But he’s dead serious about climate policy. And he says a carbon tax is both the most transparent and politically feasible idea to cut emissions. He points to British Columbia, which has had a similar carbon tax in place since 2008. The I-732 campaign has grown from a volunteer operation to one with several paid staff, a headquarters near Gas Works Park and more than 20 chapters across the state. The campaign has raised $250,000. Still, there is no guarantee they’ll make the ballot. Organizers expect to reach about 100,000 signatures by the end of July. As an initiative to the Legislature they need 246,732 valid signatures from registered voters by the end of the year. That would force lawmakers to either pass the measure or send it to a public vote. The effort may face rough shoals ahead, with the politically connected alliance leadership discouraging support. As with many political disputes, this one is largely about money. While the alliance’s 2016 initiative has not been revealed, it’s clear that backers don’t agree with I-732’s revenue-neutral approach. Michael Mann, a member of the alliance steering committee, stressed that he respects Bauman’s effort. Mann and other alliance supporters suggest that spending carbon-tax revenues on clean-energy investments, schools and other community programs could prove more popular than tax cuts. Meanwhile, polling results circulated by the alliance claim I-732 starts at just 39 percent support when voters are read the ballot title. While arguments for the measure boosted support in the poll, MacLean said its numbers are too weak to withstand likely assaults from the fossil-fuel industry. She declined to release the full poll results. I-732 supporters disagree. They say a youthful electorate that will turn out in 2016’s presidential election gives their proposal more than a fighting chance. And they argue a carbon tax is simpler to grasp for voters than alternatives like a cap-and-trade plan, which relies on auctioned pollution permits bought and sold in a stock-exchangelike system. Hendrik Wolff, an assistant professor of economics at the University of Washington, whose research includes climate policy, said both cap-and-trade and carbon taxes are viable paths to the same goal. “The advantage (of a carbon tax) is that it is easier administratively to implement,” said Wolff, who supports the initiative. Other I-732 backers say it would be foolish to run a climate initiative that also seeks to grow government spending. With its revenue-neutral approach, I-732 can draw support from across the political spectrum, supporters argue. “The difference between Carbon Washington and the Alliance is that Carbon Washington is building a bipartisan coalition, and the Alliance is building a coalition of the left,” said Joe Ryan, a board member of Carbon Washington and former president of the Washington Environmental Council (which is part of the alliance). Todd Myers, environmental director for the Washington Policy Center, a free-market think tank, has backed I-732’s British Columbia-style carbon-tax approach. However, it’s a stretch to believe many Republicans would support the carbon tax. Most of the I-732 endorsers hail from the more liberal side of politics, including Seattle City Councilman Nick Licata, former Seattle Mayor Mike McGinn and former King County Executive Ron Sims. But the alliance boasts a much longer list of supporters, including groups closely associated with the Democratic Party’s political base, from the state Labor Council to green business and transit activists. It also includes groups representing African-American, Latino and other minority communities. And some leaders of those groups are criticizing the I-732 campaign, which they say has failed to be so inclusive. Climate change will disproportionately affect poor and minority communities, they note, so any climate initiative ought to place racial equity front and center. “We believe that is what it will take to fight and win against the fossil-fuel industry,” said Aiko Schaefer, a coordinator of Communities of Color for Climate Justice. Bauman countered that I-732 will help the poor and minority communities — by fighting climate change, cutting the regressive sales tax, and by funding the Working Families Tax Credit, which would offer a tax rebate of up to $1,500 a year for 400,000 low-income working families. Notwithstanding their current disagreements, both sides continue to talk. McGinn, who endorsed I-732, said he was drawn to the “grass roots and volunteer energy.” He criticized the “lackluster leadership” of larger environmental groups that have been overly deferential to politicians who haven’t delivered. But McGinn said he’s largely agnostic on whether a carbon tax or some other alternative is the best approach. He predicted I-732 supporters and the alliance may wind up under the same tent by 2016. “There is plenty of time for everyone to make peace,” he said. Information in this article, originally published July 26, 2015, was corrected July 28, 2015. A previous version gave an incorrect month for when the organizers of Initiative 732 expect to have collected 100,000 signatures.